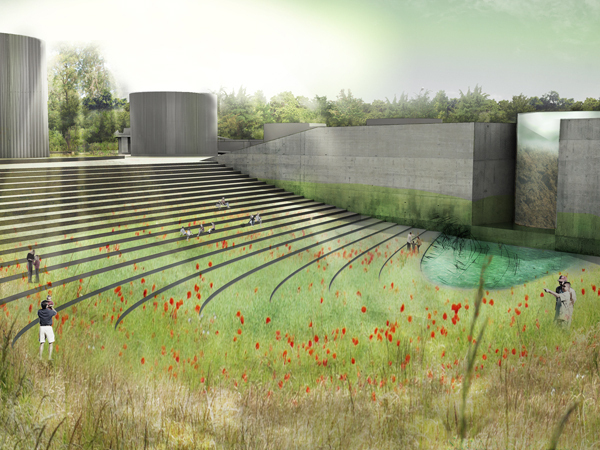 A new waste and water recycling system integrated in urban landscape as an ecological visitor attraction. 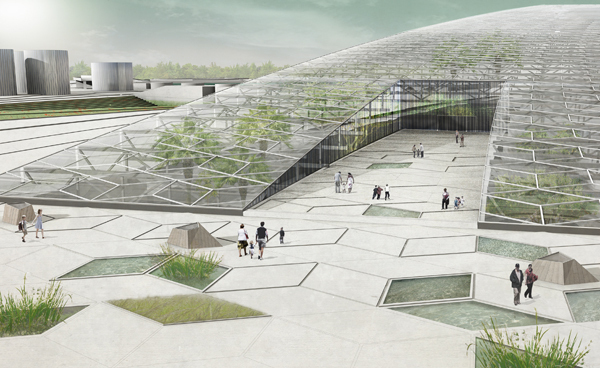 The thesis of Thomas Petch explores an alternative strategic development to the Barton Renewable Energy Plant in Davyhulme, Manchester. The brief for the project developed in parallel with the BREP, which has recently been refused Planning permission after committee review. Since its conception, the BREP, a biomass incinerator, has been heavily contested by local residents who have had very little say in the design process and fear the detrimental health effects and social impact of the proposal. In opposition, the Breathe Clean Air Group was set up by local residents in order to campaign against the BREP and spread awareness of the social and environmental problems with the proposal. Using the BCAG’s concerns and findings as a point of departure, I have developed a body of research which supports the design of a new waste recycling system. 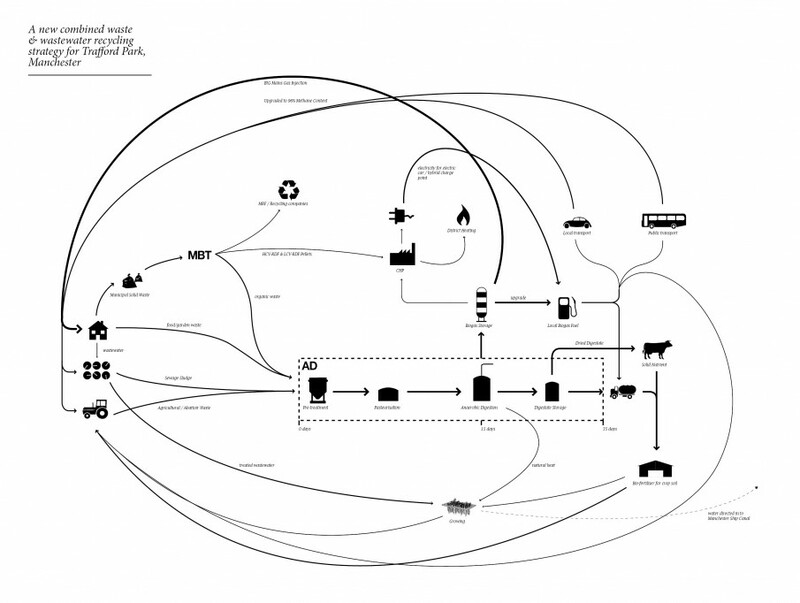 This is a system, developed on a pro-bono basis, which combines existing facilities and the mutually supportive processes of Anaerobic Digestion and constructed wetlands – processing organic waste and wastewater. 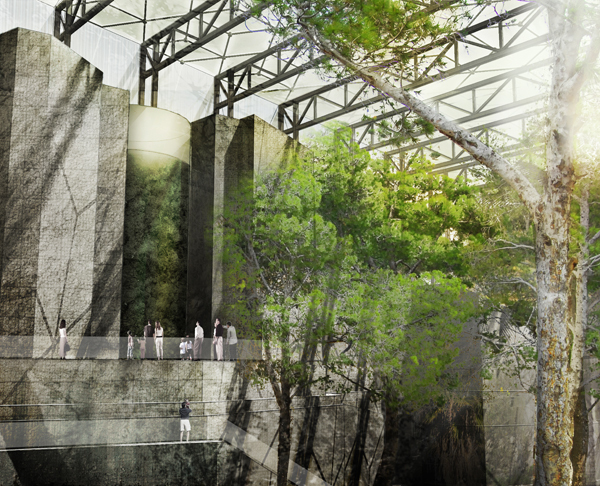 This manifests itself architecturally as an ecological visitor attraction on a vast scale. The scheme aims to both compliment and improve Manchester’s current waste strategy without turning to a highly controversial, long-term solution which may jeopardise the development of technologies which are both more efficient and far less damaging to public health. 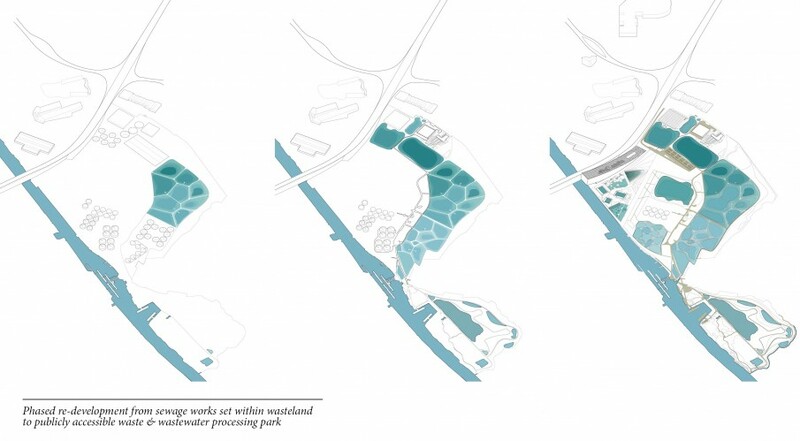 This strategy converges on the same site as the existing United Utilities sewage treatment works and the proposed site for BREP, whilst operating on a far larger scale – exploiting the catchment of the Trafford Centre and other surrounding amenities whilst establishing itself as an interesting and exciting visitor attraction with an educational agenda. An evolving master plan incrementally replaces the secondary and tertiary stages of the mechanical wastewater treatment process with publicly-accessible constructed wetlands. 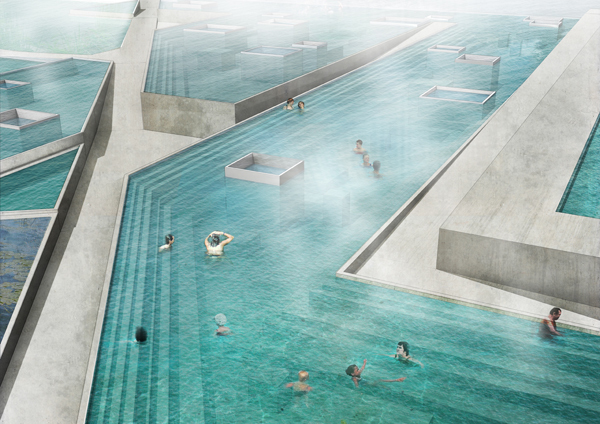 The AD plant which accompanies the development becomes part of the architecture itself, forming the backbone for public programmes based around heat and water. Thomas Petch In the Urban Agriculture Growing Sites building schoolchildren and workshop groups help harvest tropical fruit and vegetables and learn about rainforest ecosystems. Thomas Petch The AD plants which accompanies the development becomes part of the architecture itself; forming the backbone for public programme based around heat and water. 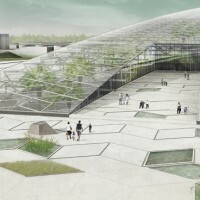 Thomas Petch The Urban Agriculture Growing Sites combines the treatment of wastewater and an ecological visitor centre for schoolchildren and workshop groups.